Each Syrian furniture masterpiece is handcrafted to perfection by our highly skilled and passionate craftsmen. 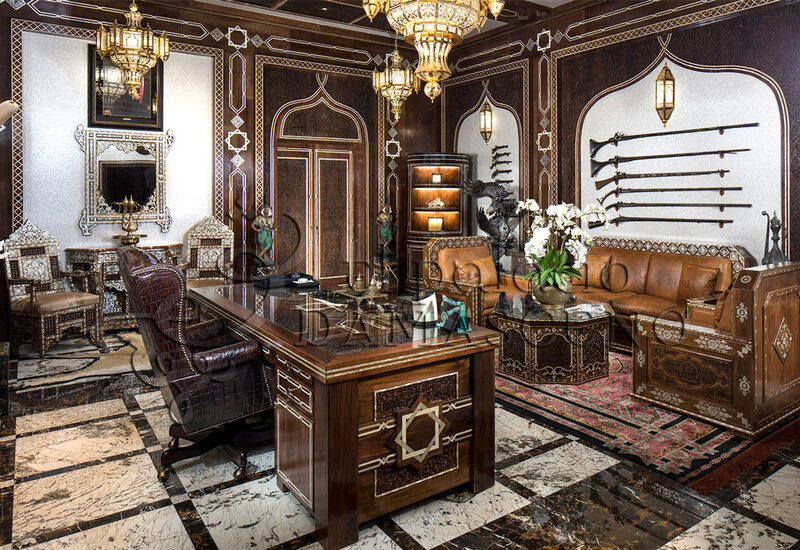 We carefully coordinate the efforts of different craftsmen and use the finest materials, including inlaid Syrian mother of pearl and by using traditional techniques such as intarsia we are able to create 3 dimensional effects that make our Syrian furniture one of a kind. Surprise your clients with unique items. Merge your modern design with oriental spirit. Make your hotel project a story of 1001 nights. Luxurious desks for your selective clients. Special office designs for Elite customers. Give a great impression to your visiting clients. Take a tour around our inspiration board. Discover Graceful and Intricate Designs. Give your Interiors a touch of Elegance & Luxury. Our unique Syrian furniture masterpieces are instantly recognisable for their meticulous detail and timeless beauty, and are a firm favourite with interior designers worldwide. By fusing traditional Syrian design with a quirky modern twist, our Syrian inspired furniture brings the warmth of Oriental style into the 21st Century. 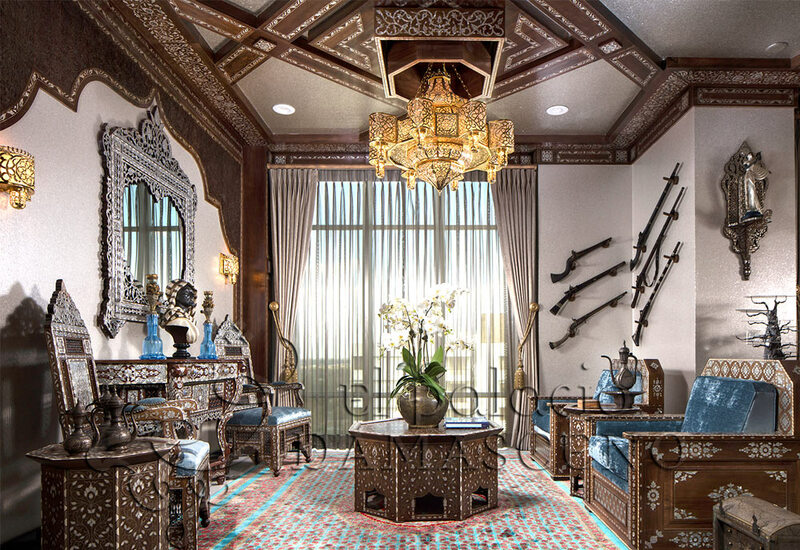 Our collection of Syrian furniture is immensely popular with interior designers and decorators. 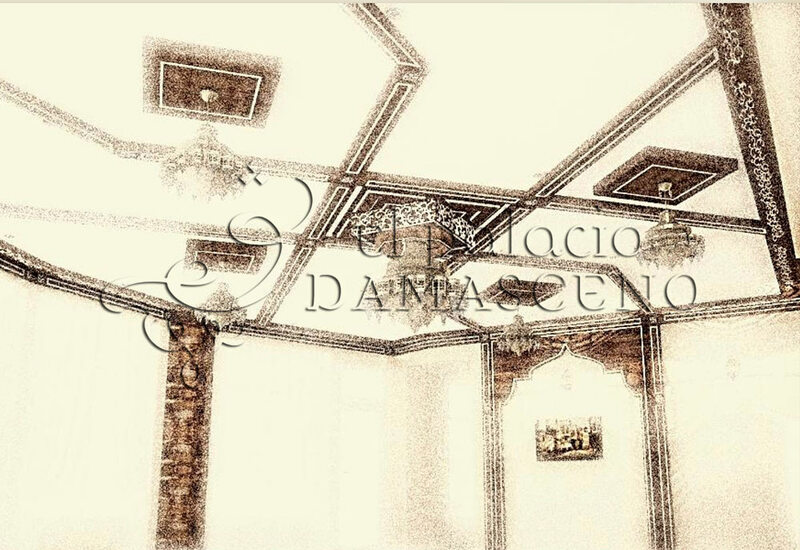 We consider interior designers the most qualified critics of our work and El Palacio Damasceno are extremely proud to be the first choice for some of the most renowned and highly regarded interior designers in the industry. If you are an interior designer looking to impress and exceed your client’s expectations we ask that you consider a work of art from our furniture collection. Because we value interior designers and the work they do so much we are willing to offer our breath-taking Syrian furniture pieces at a special discounted price. If you would like to find out more or you would simply like to speak to a member of the El Palacio Damasceno team you can contact us by phone or by entering your details into the contact form provided on our website.